Jolly Collier FC circa 1965/66, taken outside the pub. image kindly supplied by Patricia Coton who says they were a great team. Pat is the young lady in the back row. I’ve had an enquiry come in from over in the US about a long lost pub in Brownhills, also asking for a copy of Clive Roberts’ latest book, ‘Old Public Houses of Brownhills (Part 1)’ – I’ve passed the enquiry for the book directly to Clive, but in the meantime, it raises some interesting questions readers may have information on. I live in Ann Arbor, Michigan, USA, and want to order Clive Roberts’ book, Old Public Houses of Brownhills, Part One. 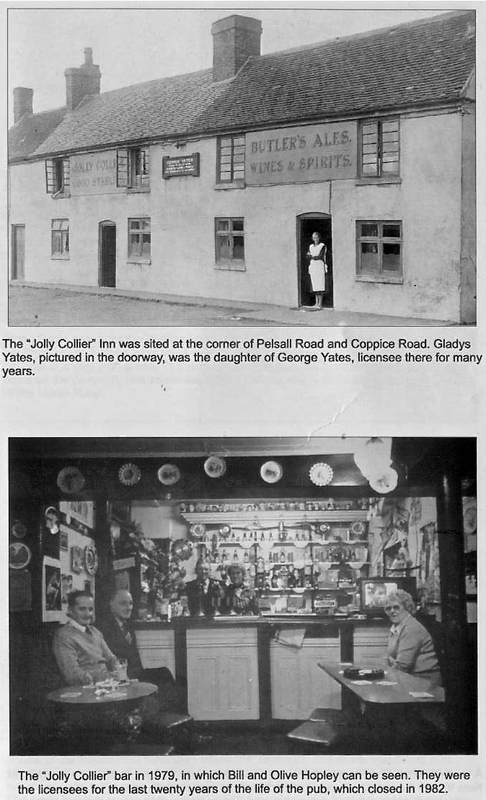 I am particularly interested in The Jolly Collier pub, once managed by my grandmother’s uncle, Isaiah Edensor Baggott. I would love to know what history he has for the pub, and what he may know of Isaiah Baggott. I am quite interested in the licensing board appearances because Isaiah seems to have appeared both before and after he died. I am writing an article about the suspicious circumstances of his death and have been searching for a photo of The Jolly Collier to accompany the article. Can you direct me to a way to order the book from over here and also a way to locate a photo of the pub? I had one once, but it has disappeared from my computer. The Jolly Collier was an interesting pub thats tood on the corner of Coppice Side and Pelsall Road, and was lost under the extension to the T&S Stores/One Stop warehouse in the early 90s, after a long period of dereliction. It’s not a house I know much about, but a range of articles from the blog mentioning it can be perused here. I’m very interested in The Jolly Collier. I’ve never really met anyone who drank there regularly. I remember the post box in the front wall, and it being derelict for absolutely ages before being demolished to make way for T&S Stores extension. Taken from ‘Memories of Old Brownhills’ by Clarice Mayo & Geoff Harrington. Baggott seems to be a recurring name in local history, particularly that of Walsall Wood – can any of the Wood Contingent clarify there please? I thank Lois for an interesting enquiry, and I hope readers can help with it – please do comment here or mail me: BrownhillsBob at Googlemail dot come. Thanks. Hello readers of the blog. Just an update. Old public houses of Brownhills (part 1) is selling well. Started to put Old public houses of Brownhills (part 2) together, this one will be covering: Anchor Inn; Boat Inn; Fortune of war; George and Dragon; Leopard Inn; Malt Shovel; Red white and Blue; Royal George; Royal Oak; Shire Oak Inn; Shoulder of Mutton; Station Hotel; Warrener’s Arms; Wheat Sheaf 1 and 2; and the Woodman, total of 15 pubs. The Malt Shovel is a new one for me, it stopped trading around c1870. Big thank you to Brownhillsbob and the readers of the blog. Clive Roberts is a noted local historian and author who has previously written excellent and sought after books on Shire Oak, Walsall Wood and Brownhills. He comments and contributes frequently here on the blog and is a stalwart of the local history community. The pubs covered in part one are: Anglesey Arms, Chase Inn, Hussey Arms, Jolly Collier, The Crown, Lamb Inn, Old Wilkin Inn, Pear Tree, Prince of Wales, Queens Head, Railway Tavern, Rising Sun, Swan Inn, Turk’s Head, White Horse and the Yew Tree Inn. That’s 16 pubs in all… The book covers known landlords and some of the past history from newspaper reports and other sources, together with some interesting photographs. Copies are available for just £8 each. You can obtain yours from: Brownhills Library, Walsall Wood Library and also The DEI Convenience Store (Corner or Red shop) in Friezland Lane, and last but not least Walsall Local History Centre. I’m also selling the book on eBay. Clive’s books have garnered him a great reputation for well researched, engaging local history writing that uncovers detail that others may well miss – and this book is no exception. If you have any questions or observations for Clive, please do comment here or mail me: BrownhillsBob at Googlemail dot com, and I’ll draw them to his attention. I wish Clive all the best and look forward to Part Two! Another wonderful book from Walsall Wood author Clive Roberts – available right now! Thanks for the plug Bob. I have sent Lois an Email so should be able to sort something out for her. I grew up in the Jolly Collier. In the 1950’s my Grandfather Percy Chapman was the landlord, he died in 1959 and the Collier passed to his Daughter Olive Hopley with her husband Bill. I have many great memories of the old place! Is there anyone out there who could identify the gent sitting next to the bar please?